When my friend and I decided to take a week long trip down to Tennessee, one of the things I anticipated most (aside from hiking in the Smokies) was bar-be-que. After driving through Kentucky (and yes, we did stop off to try KFC in Kentucky…), we finally arrive in Downtown Nashville. It was mighty hot that day and pretty much every day we were in Tennessee, it was the month of August. Once we inched our way through the door, it was still sticky humid even with the air conditioner blasting cool air over us. Jack’s was a pretty busy place but the food was amazing. With different bar-be-que sauces to try out and some amazing cornbread to go with the pulled pork — my friend went nuts and even bought dinner to bring to the campsite we were staying at. Looking back, I only wish I had bought some dessert. That’s my sweet tooth talking. When my friend asked me if I wanted to hit up the Consumer Electronics Show (CES) a couple of years ago, I figured … why not? I’m not really into gambling and all the entertainment along the main tourist strip in Las Vegas but I was very interested in seeing if there would be any opportunities for outdoor activity. I could only handle so many shows and technology presentations. After looking around for some options, I came across Neil Sobelson’s Hike This! My friend and I didn’t want to rent a car but we needed someone to help guide us through a good hike or in this case, an awesome rock scramble. Neil, who I will say is one of the best guides I’ve ever met, picked us up from the hotel and took us to Red Rock Canyon. 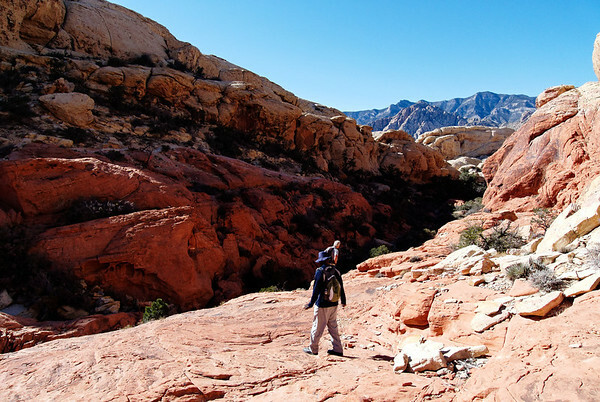 A beautiful conservation area that thankfully … most of the tourists who visit Las Vegas … don’t make time for. The rock scrambling was a solid challenge and Neil was excellent at determining whether we would be ready to tackle certain parts of Red Rock Canyon. I figure he must’ve had lots of experience and from speaking with him during our day out, he knew Red Rock Canyon inside out. The landscape was stunning to look at (love the red!) and it was fun observing my friend who is not an outdoors type of person at all go hiking, but one of the most memorable things was simply having that opportunity to meet Neil himself. Very personable and after our awesome hike, he even took us out for lunch! We did not anticipate that whatsoever and were floored. On top of that Neil would often take photos of us along the way as we scrambled up boulders or inched our way down a rock side. This wasn’t the only outdoor activity we tried in Vegas. My friend and I also went kayaking from the base of Hoover Dam, but that’ll be a story for another time. My first time visiting South America led me into Bolivia. I actually had no idea what to expect as my original intention was to simply visit Chile. Bolivia was quite an eye opener as I travelled from Chile, a country with a standard of living that was very comparable to Canada, into an economic-struggling country. That said, it was definitely one of the most beautiful places I have had the opportunity to visit. Also where one of the most outrageous experiences I’ve had took place as well. I happened to be visiting sometime between late February and early March, which happened to be Carnaval season. 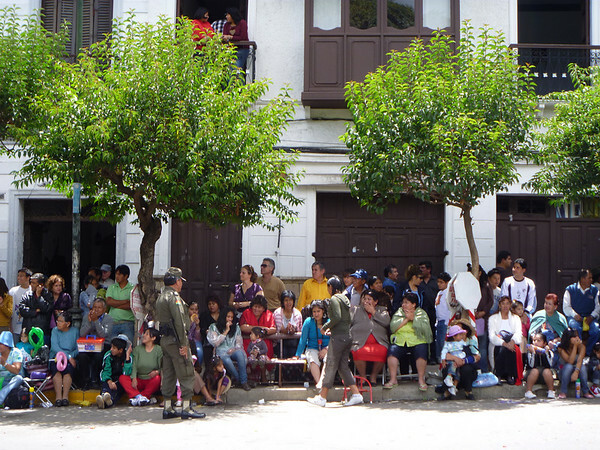 Despite seeing kids running through the streets of Potosi spraying one another with water guns and in some instances, almost getting drenched by a boy who tried to dump an entire bucket of water on us — we had no idea what we were getting into when we walked into Sucre. After getting off the bus, we walked towards the street that our hotel was on. There was a lot of racket and music — which we figured was simply festivities — but no sooner when we turned the corner, we were greeted by sidewalks filled with parade spectators. Let’s just put it this way. I could literally see everyone’s eyes immediately light up. What better thing to do than pummel a bunch of gringos with water balloons? Perfect. Opportunity. I saw a wave of water balloons launch into the air towards us, and I just ran down the street for sanctuary. These festivals (and excuses for city-wide water fights) would take place practically all day. It was the most hilarious and yet also stressful event to experience. Try going down the street to buy some food — you end up getting chased down by kids and teenagers — eager to showcase their marksmanship skills … and trust me, they got skillz. Eventually a group of fellow travellers banded together to form Team Gringos to see if we could fight back a little. There were a few successes … but everyone ended up walking back drenched and cold. It was still an awesome time. Quite a few years ago, some friends of mine and I went up to Algonquin Park to do some snowshoeing while staying at a nearby local hostel. It was really cold that winter; to the point that snow in Algonquin had frozen. What we didn’t expect was to find ice everywhere. I laugh when I think back to the time when one by one, each of us slipped, fell, and slid into one another down the hiking trail. The best part I think of is when we stumbled upon the largest icicle I’ve ever seen while hiking the Bat Lake trail (I think). We did take pictures next to it but I think this picture really shows how large it is compared to the trees.